Did the tie belong to Cooper? Fact: Modern day Tena Bar is severely eroded and exposing natural clay layers that run the length of the beach. Fact: The Palmer Report discovered and interpreted a buried clay layer as man-made from the dredging operation. Interpretation: Palmer's original report claiming the clay layer was a result of the dredging was inaccurate. Fact: The rubber bands were found intact on the bundles of cash. Experimental fact: All experiments testing rubber band survival in nature determined they did not last 12 months. Interpretation: The rubber bands could not have remained intact over the several years they took to reach Tena Bar as would be required based on the Palmer Report. Further interpretation: The clay layers beneath the beach are in fact natural occurrences indicating that the Cooper bills were not deposited there after the dredging. The rubber band lifetime constrains the arrival of the bills on Tena Bar to less than one year. In 1980 when three bundles of money was found just beneath the surface of the sand on Tena Bar, associate professor of geology at Portland State University, Dr. Leonard Palmer an expert on sedimentation was called in. He proceeded to examine the area where the money was discovered and then dug an exploration trench from the waterline, east to a point high on the beach near the money. This is a standard procedure to geologically understand the stratigraphic layers in the sand and map the depositional history of the beach. He found several distinctive sand layers and several feet down, a clay layer, all of which were below the level of the money. Dr. Palmer interpreted that this clay layer was deposited by the dredging operation in 1974 . This lead to the Washougal Wash-Down Theory - that the money had taken several years to travel by natural processes to Tena Bar, where it was buried either with or sometime after the dredging that deposited the clay layer. The Cooper Research Team went to Tena Bar in March of 2009 and found that the beach had undergone severe erosion. The level of the beach was now several feet below its original level. This was evident from the exposed roots of large and small trees higher on the beach (Fig. 2). The largest trees had come loose and washed down river. One large tree was left from the original 1980 photographs which had fallen over but stayed in place. This tree and the original dirt road running along the beach were used to recover the original find location. The eroded beach now clearly exposed several continuous layers of consolidated clay alternating with clean sand (Fig. 1). 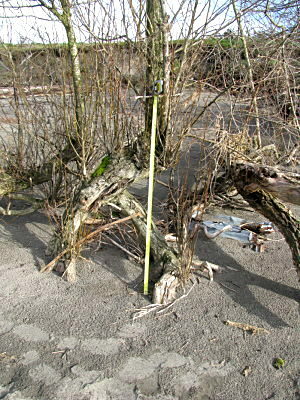 Measurements based on the level of the grass at the top of the beach and the exposed tree roots (Fig. 2) indicated that the now-exposed clay layers were at the same approximate depth as Palmer's original trench. FBI records of the dredging operation in 1974 at Tena Bar stated that the dredging spoils were pushed 50 yards in each direction . 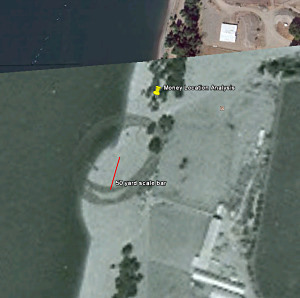 Aerial photos from 1974 showed the center of the dredge spoil pile on the beach (Fig. 3). This data combined with the re-location of the money find allowed a reconstruction of the 50 yard limit of the dredging sand. See Tena Bar for a more complete discussion. The discovery of the natural clay layers suggests that Palmer misinterpreted the clay as man-made when it fact it was a natural part of the beach stratigraphy. Palmer working with limited information could not have interpreted the clay layers as a natural feature of the shoreline. The continuous erosion of the sand since 1980 to its current level (Figs. 4,5), suggests that prior to 1974, the level of the beach was maintained by the addition of dredging sands. These sand deposits can be seen in subsequent years moving downstream with river flow along the sand bar. This further suggests that once the dredging sands were no longer replenishing the beach after 1974, natural erosion took place which eventually uncovered the Cooper Bills in 1980. 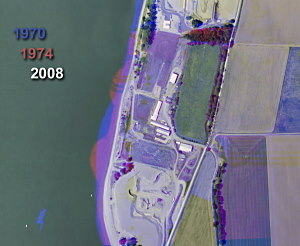 The FBI files stated that the dredge used in 1974 was 24 inches in diameter . This relatively small dredge would be virtually incapable of passing several bundles of bills through the system unharmed. When the bills were found, the rubber bands were brittle and crumbled off . In 1974 the rubber bands would have already been exposed to the elements for more than two years. The rubber band testing outlined elsewhere in this study indicates that after years of exposure, the bands would have long lost their ability to contain the bundles intact through a dredging operation. The Palmer Report was based on the information available at that time. The new information gathered in this study now indicates that the dredging operation did not transport the bills from the bottom of the Columbia River but could have been a contributing factor to the bills staying buried until 1980. The information collected by the FBI, combined with the known positions of the dredge pipes, suggests that the money find was not within the area covered by the dredging material. This again indicates that the money burial was not due to dredging operations. The Palmer Report, while perfectly credible at that time, does not remain viable given this new data and no longer supports the Washougal Wash-Down Theory. 1. FBI Transcript, Palmer: "Professor PALMER advised that he found the beach area in the vicinity where the money was found to be in approximately four different layers. These layers consisted of an upper sand layer, a post dredging sand layer, a clay lump (dredge) sand layer, and below that an older sand layer." "Professor PLAMER stated this clay layer in all probability, was deposited during that 1974 dredging." 2. FBI Transcript, Benchly: "The material deposited on the beach was spread with tractors probably over an area of 50 yards in each direction. 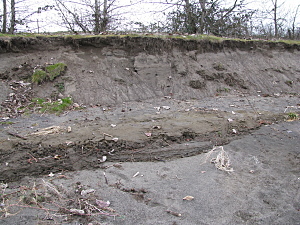 Because of the flow of the Columbia River, sand deposited on the bank by the dredge is washed away. Additionally, an amount of dredge material deposited on the beach slides back into the river." 3. FBI Transcript, Benchly: "The dredge "Washington" of the General Construction Company did the dredging on this project. It had a 24 inch pipe with a wiper bar inside the pipe. The wiper bar keeps large objects such as rocks from passing through the pipe. 4. FBI Transcript: "As he did so, the boy turned up three bundles of money wrapped with rubber bands, which was a short distance below the surface of the sand. The boy picked up the money and they looked at it and determined that it had once been $20 bills." "The money was badly decomposed and was held together with rubber bands which were so old they crumbled away immediately upon handling." Copyright 2017 © Tom Kaye. All Rights Reserved.